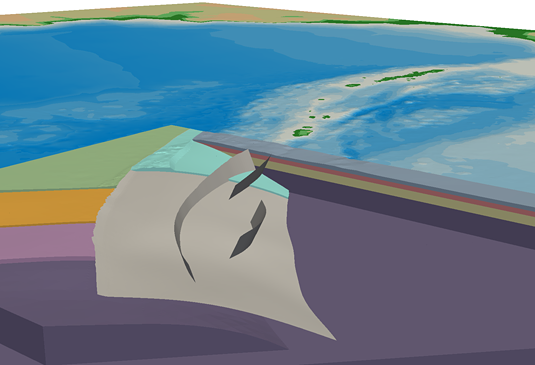 In subduction zones – locations where tectonics plates meet at seams in the Earth's crust, with one plate moving below the other – earthquakes occur at regular intervals. However, it is not yet precisely known under what conditions such "subduction earthquakes" can cause tsunamis or how big such tsunamis will be. Earthquakes are highly complex physical processes. In contrast to the mechanical processes occurring at the rupture front, which take place on a scale of a few meters at most, the entire Earth's surface rises and falls over an area of hundreds of square kilometers. During the Sumatra Earthquake, the tear in Earth’s crust extended for more than 1,500 km (approximately equivalent to the distance from Munich to Helsinki or Los Angeles to Seattle) – the longest rupturing fault ever seen. Within 10 minutes, the seafloor was vertically displaced by the earthquake by as much as 10 meters. "To make it possible to finish the simulation on SuperMUC within a reasonable period of time, it ultimately took five years of preparations to optimize our SeisSol earthquake simulation software. Just two years ago, the computing time for the simulation would have been 15 times longer," explains Michael Bader, a professor of informatics at TUM. In particular, says Dr.Gabriel, "The splay faults, which can be imagined as pop-up fractures alongside the known subduction trench, led to abrupt, long-period, vertical displacements of the seafloor, and thus to an increased tsunami risk. At present, this capability of incorporating such realistic geometries into physical earthquake models is unique worldwide." The project was funded by the Volkswagen Foundation (Project ASCETE), Intel (as part of an Intel Parallel Computing Center) and the Leibniz Supercomputing Center of the Bavarian Academy of Sciences.